﻿To encourage members to perfect, by selective breeding, sound Golden Retrievers and to do all possible to develop and promote their natural abilities and quality, while still maintaining their exceptionally good dispositions. 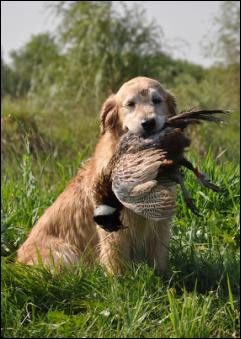 Do all in its power to protect and advance the interests of the breed by encouraging sportsmanlike competition while conducting sanctioned and licensed specialty shows and other AKC events that promote the talents of the golden retriever. We urge members and breeders to accept the standard of the breed as approved by the American Kennel Club, as the only standard of excellence by which golden retrievers shall be judged.